There is a Michigan Historical Marker on this site because of an important technological development perfected at this location by Robert Pauli Scherer, one that reduced morbidity and mortality rates around the world. Many people find it difficult to remember to take medicine, or are hesitant to take medicines and drugs that taste awful. You can imagine the difficulties of getting young children to swallow pills that they intensely dislike. Working in a shop in the basement of his parents' home, Robert Scherer, at age 24 in 1930, invented or perfected a rotary die encapsulation machine that produced soft gelatin capsules. As a result of his invention, pharmaceutical products could be encased in a soft gelatin capsule that people could readily swallow. Think about how often you use such capsule when you are sick or when you wish to improve your health or your looks. This invention was a major step forward for the pharmaceutical industry. Robert Scherer, in 1933, founded a corporation to produce these soft gelatin capsules. This firm rapidly became the world's leader in this industry, and eventually had plants in 12 countries. Robert Scherer, a graduate of the city's public schools, is among Detroit's most productive inventors. Prior to his death in 1960, he obtained 52 patents. His innovative machine is now in the Smithsonian in Washington. For some years in the 1990s and early 2000s, the Scherer home was used as the Detroit Children's Museum. That organization was an affiliate of the Detroit Science Center, also located in the city's Cultural Center. The Detroit Children's Museum then moved to a new location at 6134 Second Avenue. Unfortunately, the Detroit Science Center ran into financial troubles in 2011 and was closed in September of that year. The Detroit Children's Museum on Second Avenue also cloased. Detroit newsgroups in July, 2011 carried speculations that investors and donors would soon announce a financial plan that would permit the reopening of the Detroit Science Center. Perhaps, the Detroit Children's Museum will also reopen at some point in the future. In 2011, the Scherer residence was purchased by a group that intends to establish an Hellenic Museum of Michigan. There announced aim is to establish a Mouseion or House of the Muses similar to the one that existed in ancient Alexandraia. Michigan Historical Market: Erected September 5, 1984. This marker is clearly visible from the sidewalk on the north side of Kirby just east of Woodward. Use in 2012. 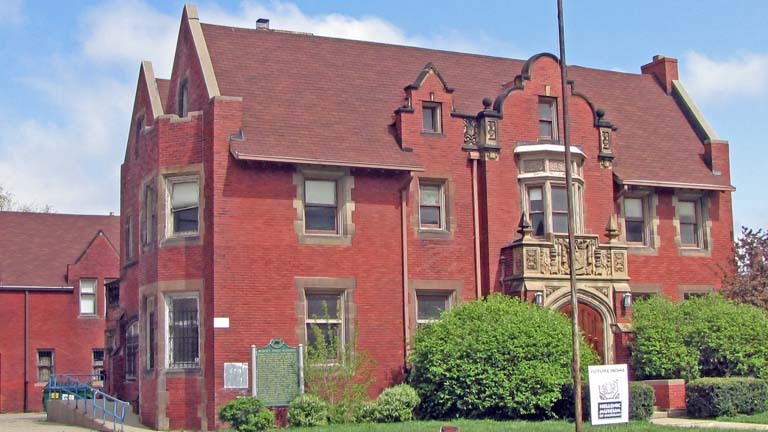 This building was occupied for many years by Detroit's Children's Museum, was purchased recently and will be converted into a museum of Greek Culture in Detroit.